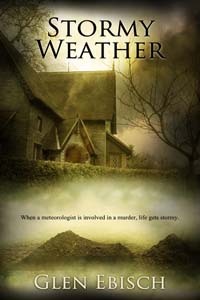 When the body of Travis Lambert, senior meteorologist, is found buried in a shallow grave next to the house of Stormy McCloud, junior meteorologist, things look bad. The station hires Chance Malone to investigate the murder, but her situation doesn’t improve. Malone is attractive, charming, and funny, all qualities that her past experience with men has led her to avoid. It doesn’t help that Stormy has little interest in religion, while Malone is the unusual detective that keeps a Bible in his desk drawer instead of a bottle of scotch. When Stormy’s estranged mother appears on the scene, things become even more complicated. As they discover more about the dark secrets of Travis’s life, Stormy is forced to reconsider her view of men, her mother, and her future.